Being a lawyer was not Maurice Grant’s first career choice. He began playing the piano at four, and majored in piano at college. But, as he recalls, “I realized I was not going to be the next Andre Watts.” His second choice was history professor, but he decided to attend law school instead. Now he puts his creativity to work managing Grant Law, LLC, the law firm he founded. Prior to Grant Law, Grant started the Law Offices of Grant Schumann, and Maurice Grant. Before that, he was an associate specializing in commercial real estate and employment litigation at Much, Shelist, Freed, Denenberg, Ament & Rubenstein, P.C. After law school, he spent a year as a judicial law clerk for Justice Calvin C. Campbell of the Illinois Appellate Court. Grant also served as an adjunct faculty member at the Illinois Institute of Technology Chicago Kent School of Law. As chairman of the Board at Chicago State’s Foundation, he believes he can have a big impact on African American students and Illinois itself, since one in five black students that graduate from a fouryear university in Illinois come out of Chicago State. Originally written and published for Business Leaders of Color, 2013. The Business Leaders of Color publications feature viable candidates for Fortune 1000 companies’ boards of directors. These demonstrated leaders have achieved professional success through a track record of balanced decision making; a range of experiences that reflect flexibility and an ability to transcend narrow experiences; and a respect for diverse points of view and varied ways to approach issues and topics. While achieving personal success, each has contributed to the cultural, civic and educational life of the Chicago region. 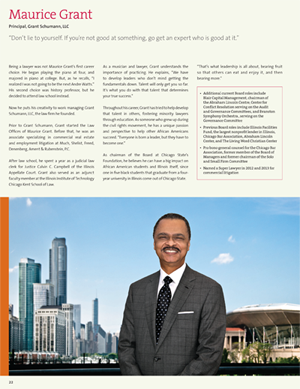 These individuals serve as inspiration for those seeking to increase inclusion of diverse candidates in their boardrooms and represent a small sample of the extraordinary talent in the Chicago region. Feel free to download a full copy of the publication.